If you feel like being creative, why not make a handmade card for that special occasion in your diary? 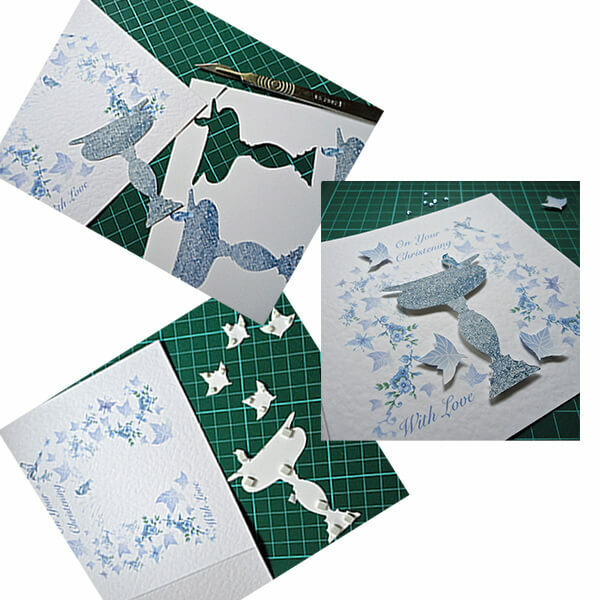 I have my design collections of printed cards, and I fill in and complete these categories with handmade cards as they are instant and can be personalised. 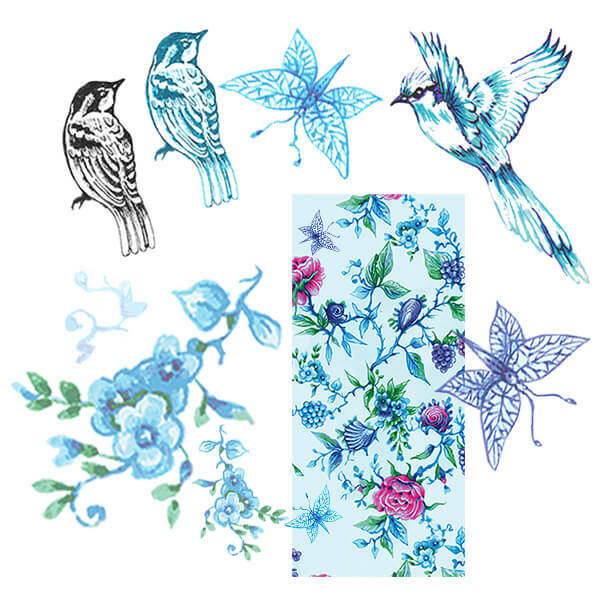 Printed flowers, leaves and birds. 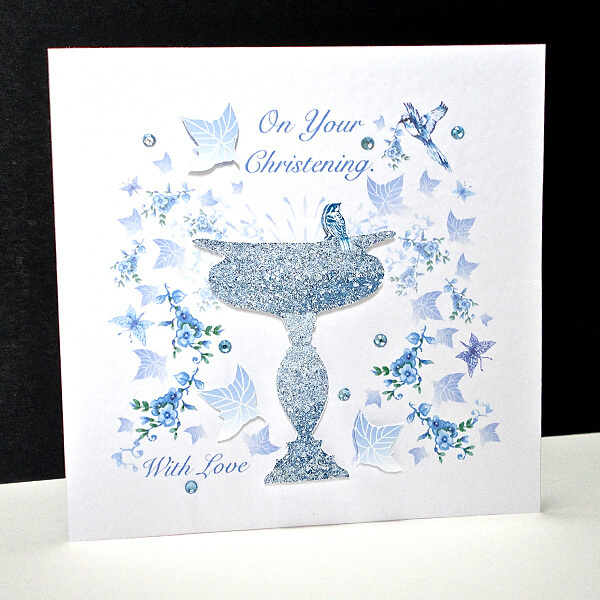 A Christening is an occasion you may not often need a card for, so this is a good reason to make this one something more personal. If you have seen any of my existing cards and collections, you will see I like to introduce textures from natural objects around. 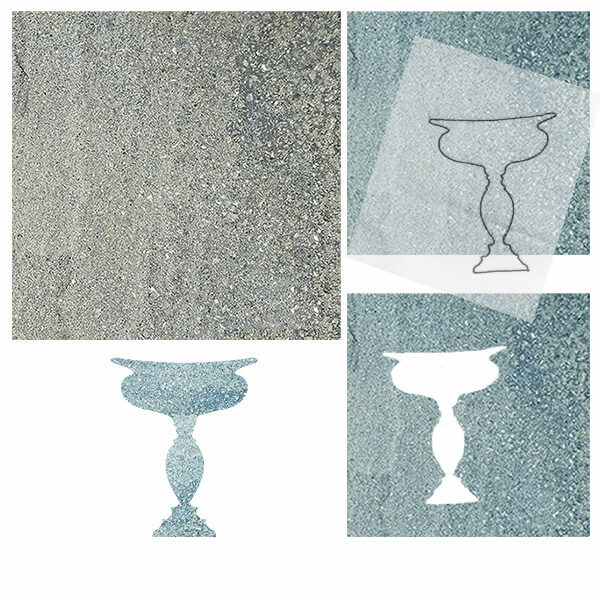 Today, I am using the pattern and texture of a paving stone to create the central object of my design – the Christening font. After drawing a perfect shape, either by hand or in Illustrator, you need to cut this out of the stone. I have done this in Photoshop, but you could always use a scanned copy and cut out the shape by hand. I always do a quick sketch of an idea, and start to draw images that are going to form my composition. I have hand-drawn the ivy-like leaves, then perfected and shaded that in Illustrator, with some splashes to represent the water. Another option would be to use leaves and flowers from fabric, wallpaper, wrapping paper or even paint your own, scan and cut, and then affix directly on to the card by hand. The pretty little flowers and butterflies are taken from my hand-painted Chintz Anglais art print. The birds also are from other designs; the small sparrow has simply had its colour changed in Photoshop. I have chosen a blank white card – 150 x 150 mm – and started to build up my design within that sized square. I lower the gradient on the font so I can place some flowers to go behind the image. 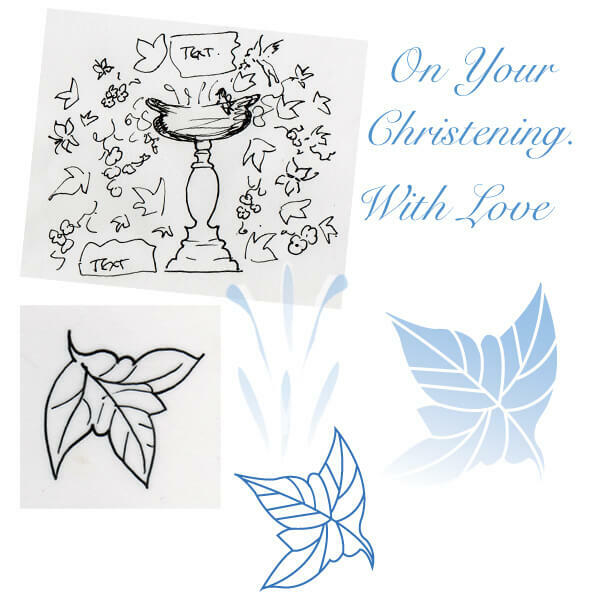 Then, I start spacing the leaves and insert the text, ‘On Your Christening’ and ‘With Love’. 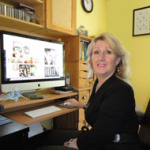 As this is printed on the card it can easily be personalised (e.g. Amy Roberts, On Your Christening Day). Then in the left hand bottom corner the date is shown on the example – 24th January 2015. When printed, the stone font will be removed as this is will be printed separately on Epsom Matt paper, and mounted later. I print out the complete template of the full card, back and front on ordinary paper, always adding a little box to the back of the card with my company website. To print the card, it is fixed on the printed template with either spray mount or two small pieces of masking tape doubled top and bottom; taking care to ensure that it is not too sticky to ruin the card when removed. What will actually bring this card to life with be the added detail mounted in relief on the printed backdrop. I print a sheet of the exact sized stone fonts and some of the blue ivy leaves I intend to add on later. Doubled sided foam pads are added large for the font and smaller ones for the leaves, which are then affixed onto the card. 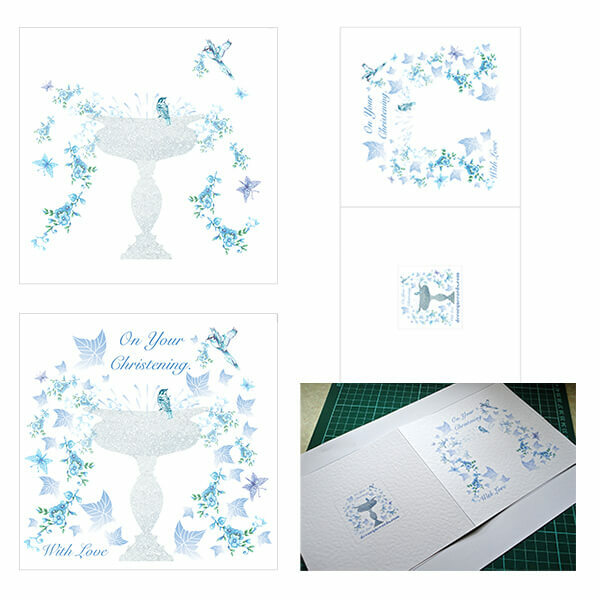 To finish this idyllic scene, a few pale blue glass gems are spaced amongst the leaves and flowers – then your card is ready to send and delight a family on a memorable day. You can buy this card here. My passion for design, pattern and colour stems directly from my love of nature. My card collections are a statement of the use of colour, retaining the intensity and freshness of flora and fauna. 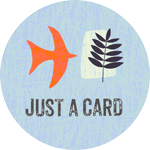 Receive my latest card designs, blog posts and special offers to your inbox every week.